We have steam heat here in Fiskdale. The oil fired boiler is about 8 years old, and although it is not rated as the most efficient one on the market, it does well. When we moved in to this old house in April of 2006 there was a very sharp learning curve when it came to learning about steam heat. I had forced hot air for too many years, and more recently forced hot water, and old radiators elsewhere in town. I like steam the best. First of all I had to learn how steam heat worked, so with the help of tutorials from the guys at Pioneer Oil company, and what I learned online, I was on my way to getting as much as I could from the system. The first thing I did was to replace all the old valves on the radiators. These valves are the little thermos shaped things that stick out of the sides of the old iron radiators that allow the steam coming in to displace the air in the radiator. Once I replaced them and set them for most efficient setting, I sat back and tweaked them for a month or so. The radiators that didn't heat well, or not at all began to heat up really well. Next was figuring out how to eliminate the banging in the pipes, they sounded like a steel drum band on some nights. The thing with steam is once the steam is delivered to the radiators it will heat very well, but as the steam cools it turns back to water and hangs about in the pipes unless it drains fully. The radiators need to tilted a bit toward the pipe that brings in the steam to drain the water effectively, and about once a month I drain the entire system of all this extra water from the pipes, and the sound of steam banging against water disappears. Took a while to figure that out. All in all, the radiant steam heat is great. It is a lingering heat, not like forced hot air that heats the air, and once it is shut off, the house soon cools off again. 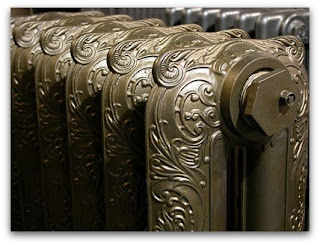 The iron radiators radiate the heat for sometime after the thermostat shuts things down. When we first moved in and had the system inspected, one thing that was strongly advised for us to do was to replace the ancient oil tank. It must have been at least 50 years old, and showed signs of rust. It would have been a disaster if it begun to leak. The guys from Pioneer Oil came over, disconnected the the tank, pumped out the oil from inside of it, then cut the old tank in half in order to remove it from the cellar. Then, the new tank was put in place, and the oil pumped inside. Amazing job in my eyes. It was all in a days work to them. Last fall I had a insulation company come over and give us an estimate for blown in cellulose insulation. We opted to replace 19 windows in the house instead in December 0f 2007, and saved (as of March) 36% compared to the year before. I also bought a set back thermostat last fall. It replaced the old, round Honeywell thermostat that had been on the wall since Ike was president. Now, this was a great investment. I set it to go on around the time Mary wakes up in the morning for work, and then to maintain a decent temperature in the 60's during the day. In the late afternoon it will warm things up as everyone comes home, then shut down around bedtime. This particular thermostat has a wheel on the side that allows for easy adjustment if I need to take the chill out of the air if I happen to be up and around when things are set for being cooler. I really think this little contraption has saved me some dollars, too. This past summer I was working on the house, and removed some vinyl siding and old clapboard, and found large circles cut into the walls with cellulose insulation in them. It looks like the house was previously insulated with cellulose, at least in the section I was working on. For a 150 year old house I was very happy to see this. On thing I did this fall, that I had planned on doing for some time, was to place 1/2 inch sheets of rigid foam insulation with the aluminum reflective/radiant coating behind each of the old iron radiators. These will prevent the walls behind the radiators from heating up and and the warmth seeping outside. I think it is working. The furnace seems to shut down sooner now with the heat being reflected back into the house. We'll see just how effective that was in the spring. There are more things I can do around here to improve my heating costs, and I will take each of them on as time goes by. Things like placing foam insulation on my water pipes in the basement, using more spray foam insulation in the little cracks and crevices that every old house has, and replacing a couple of exterior doors. It has become a contest. Each month, or so, I try to see if I can beat the previous years oil consumption, and try to do something new to improve things here on Brookfield Road. In the meantime I have those little digital indoor thermometers in different rooms of the house, and I watch them to see if the house is heating evenly, or if a particular radiator needs adjusting. Fighting the cold can be a daunting, and expensive thing to do, but with each little thing that you do, it will make a difference. Think out what you need to do, make a list, and then spend what you can to make those improvements. Don't get overwhelmed. One way to see how well you are doing is to take out your old heating bills from last year, and compare them to each heating month this year. With each improvement you do, you should begin to see signs of fuel savings. Now, don't forget, fuel costs way more this year, so don't go by the dollar amount, instead measure it against the unit of fuel you use. Oh, and one last thing. As you learn more about how to make your home warmer, share what you've learned with others. Check on your parents situation, your sister and the house she has with all those kids, and your older neighbor. Just knowing you have helped will give you, and others a warm feeling.